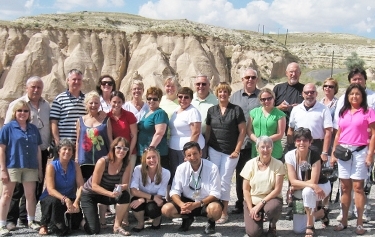 Go Ahead Tours offers a number of group tours around the world, including cruises, walking tours, Food And Wine tours, and others. Here's a great vacation idea for women that want to put together a group vacation with a group of friends or family: Go Ahead Tours has a Group Coordinator program that enables someone to get free travel, even cash bonuses, for coordinating a group to take a tour. Here's how it works. Let's say you want to organize 12 people to take a Food and Wine tour of Tuscany, which is a 10-day Italy tour covering Florence, Siena, Perugia, and finishing in Rome. As the Group Coordinator, you can get free travel for yourself and another person if you get 12 travelers to book the tour together. That can easily mean over $5000 or more in free travel for putting the group together. If you do a Land and Sea tour, you would only need 10 additional travelers to earn a free trip for yourself. There's additional benefits that extend beyond the trip, as Group Travel coordinators can earn rewards points for future travel as well. If you have an ambitious group vacation in mind, and you find yourself the leader of the group in terms of planning, it's a great way to create benefits for yourself while working with a top-notch tour operator on a well-organized tour package.